This expanded new edition features six new chapters that confront, in different ways, the growing understanding of literary works as cultural practices. These six new chapters are: "Popular Culture"; "Diversity"; "Imperialism/Nationalism"; "Desire"; "Ethics"; and "Class" by John Fiske, Louis Menand, Seamus Deane, Judith Butler, Geoffrey Galt Harpham and Daniel T.
O'Hara, respectively. 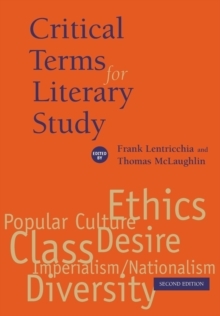 Each new essay provides a concise history of a literary term, critically explores the issues and questions that the term raises, and then puts theory into practice by showing the reading strategies that the term permits. By exploring the concepts that shape the way we read, the essays combine to provide an introduction to the work of literature and literary study.